Today’s thought is, how things can change in one breath, for good, and for the not so good. That said, I believe it’s SO important to be happy in the moment… to appreciate what there is, and what we have. Gratitude, and being grateful for happiness when life is good. In my yarny world, I really appreciate our yarn shops…I know, I know, I say this sort of thing all the time. But, look at what they put into their businesses. The creativity, the thought, the revenue and time. The gratitude goes both ways, they are grateful for you too, and your business, and what you as a customer bring to the table. Yep, you actually bring something to the table as a customer…what? How about energy, love, friendship, loyalty, knowledge, creativity. I’m glad and grateful that I have a unique place to go to when I need a distraction, when I need creativity, when I need community. And, the yarn shop is glad I came. They like showing me around to what’s new in the store, they like seeing my face, they want to know what I’m knitting or what I had in mind to knit. Carmel & I went to Mad Cow Yarn in Bothell, Washington back in January. I had never been to the store before, but it was on my list. I live in Silverdale, Washington, so Bothell was a little bit of a trek but we had fun. Carmel picked me up from the ferry and we had breakfast, Carmel helped me with my knitting, and then we set out to find this shop. The pictures that you are looking at, are from that store. Mad Cow is also on Facebook, so you can find them there. It never ceases to amaze me, at how different all the shops are. I love it. The gal that opened the store was super pleasant, and it was nice to get in there before it was real busy, so I could get some photos for you. Be happy where you are — enjoy your life — be forgiving and kind to one another — and take care of your neighbor! 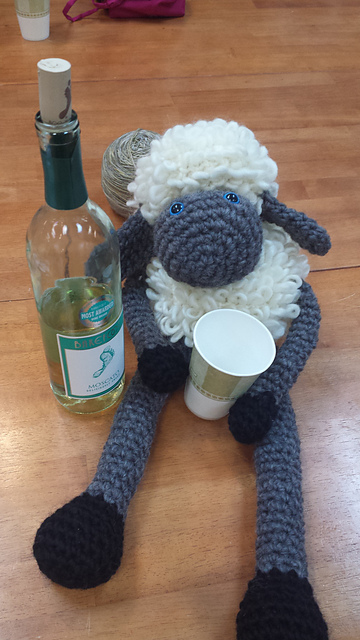 Sheldon the Sheep goes to Hartford!